ISIS has acquired commercial satellite imagery of a military compound near the town of Bid Kaneh1 in Iran where a large explosion occurred on November 12, 2011. Compared to an earlier picture of the site, an image taken on November 22, 2011 shows that most of the buildings on the compound appear extensively damaged (see figures 1 and 2). Some buildings appear to have been completely destroyed. Some of the destruction seen in the image may have also resulted from subsequent controlled demolition of buildings and removal of debris. There do not appear to be many pieces of heavy equipment such as cranes or dump trucks on the site, and a considerable amount of debris is still present. About the same number of trucks are visible in the image after the blast as in an image from approximately two months prior to the blast. Thus, most of the damage seen in the November 22, 2011 image likely resulted from the explosion. ISIS learned that the blast occurred as Iran had achieved a major milestone in the development of a new missile. Iran was apparently performing a volatile procedure involving a missile engine at the site when the blast occurred. Figure 1. 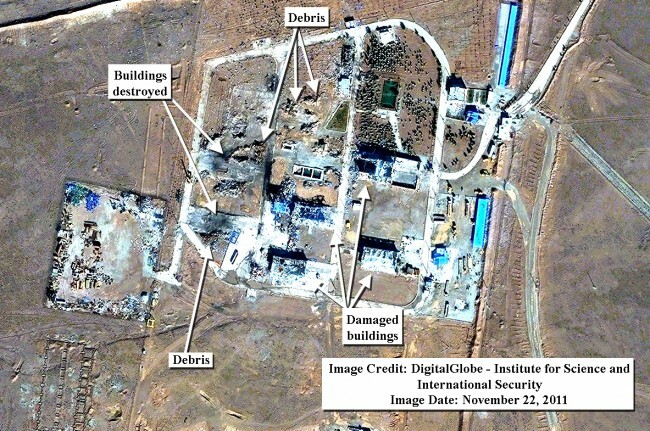 November 22, 2011 commercial satellite image showing extensive damage at a military base in Iran resulting from a November 12, 2011 explosion. Most of the buildings on the compound are extensively damaged or destroyed. Figure 2. 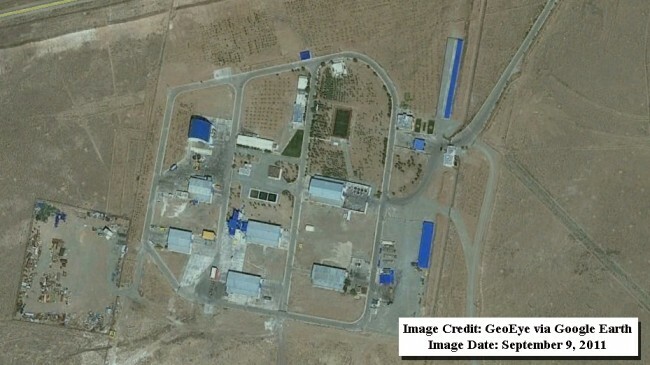 September 9, 2011 commercial satellite image of the same military base in Iran, for reference, approximately two months before the blast occurred. 1Allen Thomson, former intelligence analyst, located the geographic coordinates for the town of Bid Kaneh.